One thing that captivates almost any racing cyclist is the sight of a professional cyclists bicycle. They are looked over and investigated as if to find some sort of hidden secret for speed within those parts. There is one bike in our collection that has got to be everyone’s favorite. The Tom Boonen bike. When we received an email from a collector in Holland informing us that he was selling a Tom Boonen Eddy Merckx EMX-7, to say that we were interested is an understatement. We were also very skeptical. A bike like this needs to be confirmed to be an authentic. One quick email to Eddy Merckx Cycles in Belgium informed us that they created a special mold for Tom Boonen, all they would need to do to confirm its authenticity would be to measure it. The seller was happy to bring it to the factory to be measured, and once there the great folks at Eddy Merckx Cycles confirmed that it was a Tom Boonen bike from his 2011 season. And while we really don’t know where this bike may have been raced, we can certainly imagine it being pushed to it’s limits by Tom. Rain, cobbles, headwinds, and fierce competition, this bike has most certainly seen all of them. While 2011 was primarily a down year for Tom Boonen. He still won the opening stage of the Tour of Qatar, and added the Belgian Classic Ghent Wevelgem to his win column. For some riders, those two wins would make their career. For Tom Boonen, those victories are indicators of what he could have won, had it not been for crashes and injuries. One thing that really jumps out at you with this bike are the proportions. It’s low, and long. The folks at Eddy Merckx Cycles told us that it’s got a very short head tube, but an extremely long top tube, and when you look at it, those two dimensions really jump out at you. Tom Boonen is a big guy, standing 6’4”, so you expect to see a large bike, but you don’t expect to see the extreme amount of drop down to the handle bar. 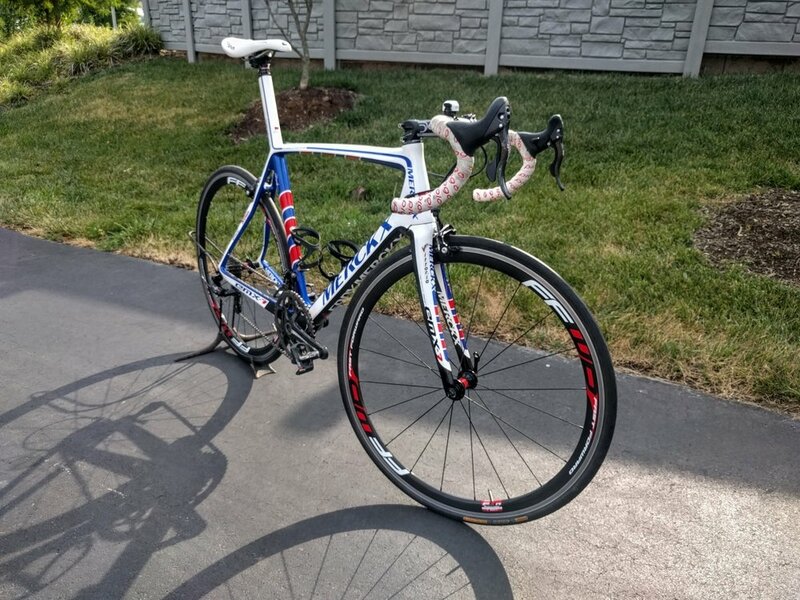 Fans of slamming the stem will love the way that this bike is set up. There is no trace of a headset spacer to be found. Tom’s use of a 140mm stem is also worth noting. It’s clear that this bike has one purpose, to make Tom ride fast. His saddle choice seems simple enough, but we’ve been told that the width of this particular Prologo is wider than one that you and I can buy. Apparently Tom likes a wider tail to the saddle to push against for leverage and power. We’ve taken our tape measure to it and it is certainly wider than anything that we’ve seen in the Prologo catalog. When you ride like Tom, companies want to make sure that you are comfortable on their stuff. What Tommeke wants, Tommeke gets. A bike with European roots always looks better with another European favorite, Campagnolo. In the is case, it’s a complete Campagnolo Record 11 group set. Tom’s use of 177.5mm cranks is another “old school” choice, in an effort to get every last bit of leverage. 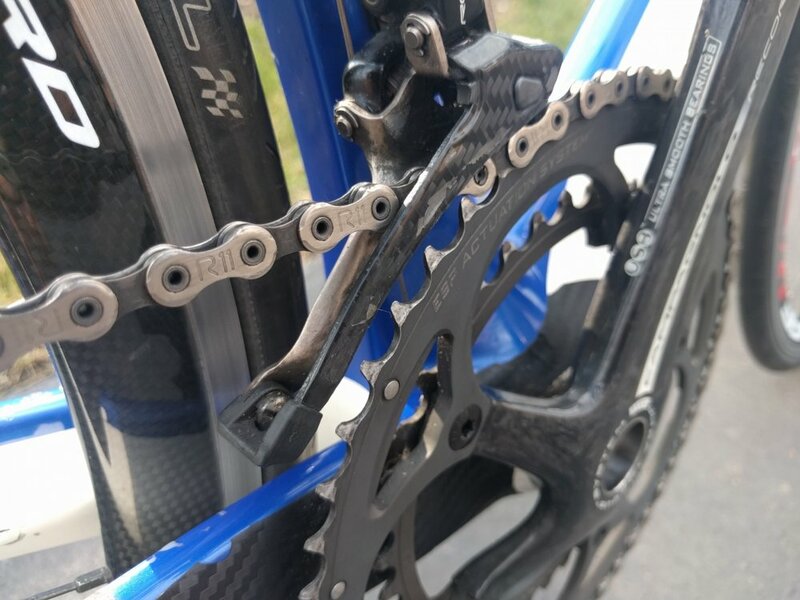 We’re sure that those cranks have churned thousands of miles, because those chainrings look like they’ve been through some extremely hard pedaling. Sometimes the appeal to a bike like this is the stuff that we don’t know, the mystery of the unknown. We certainly look at it and wonder what it would tell us if it could talk. Countless miles, countless stories, endless possibilities. Pro bikes are cool, and having this one is something that we are very proud of.